They Live’s John Nada (Roddy Piper) carried a heavy burden once he discovered that box of sunglasses down at the old church. He can’t unsee the horrible reality those shades reveal; as the old saying goes, “Once you see aliens in white and black, you never go back.” Even more than the cluster headaches, Nada’s biggest challenge was undoubtedly trying to get Frank Armitage (Keith David) to put on the glasses and see the world as Nada does. Only the glasses can set Frank free, but he resists, and what unfolds is arguably the greatest, most unnecessarily protracted fight scene in film history. Set in an alleyway filled with hazardous props, these two lumbering titans square off, each landing strikes in a leather-slapping triumph of foley work. 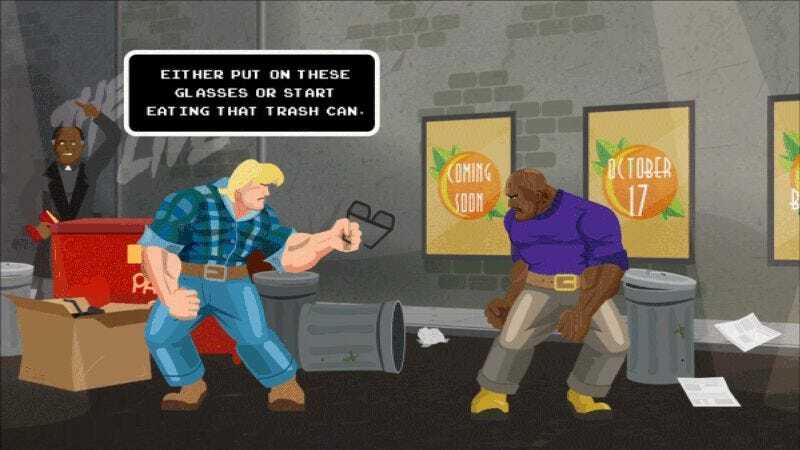 In honor of an upcoming screening of They Live, Joshua Carlon has produced a trailer that reimagines that epic brawl in the style of ’80s Capcom fighting-games. Considering that Nada and Frank go at it with all of the subtlety of Ken and Ryu, it’s only fitting that we get to see some combo hits and health bars in there as well. As with the real fight, Frank finally dons the glasses, but this time he gets some better news—a cinema marquee revealing the date of the screening. Enjoy the animated fight, and then the original below. And if you’re in the Jacksonville, Florida area on October 17, check out the special screening of They Live at the Sun-Ray Cinema in memory of Roddy Piper, along with guest of honor MMA-fighter CM Punk.